On November 7, 2018, H.E. 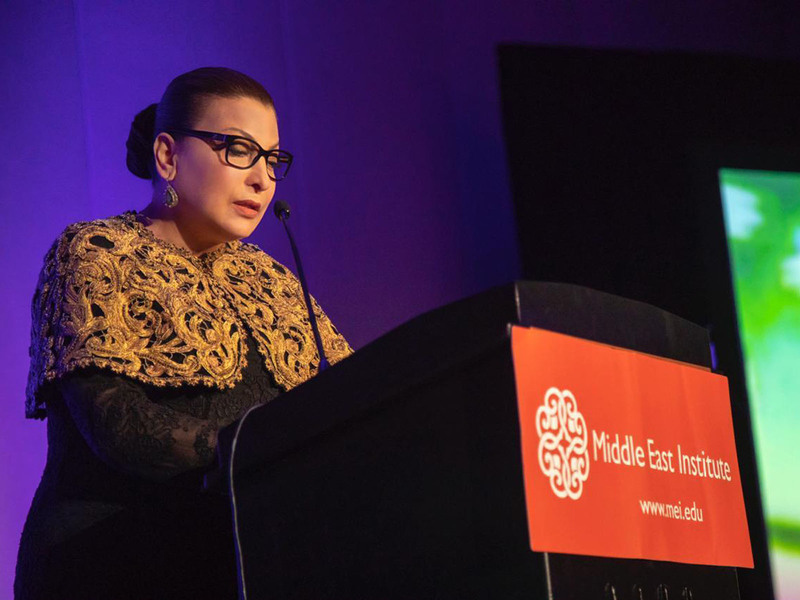 Huda I. Alkhamis-Kanoo, Founder of ADMAF, was awarded the esteemed Middle East Institute Visionary Award in recognition of her outstanding leadership in empowering artists and communities across the Arab world, and bringing Arab culture to a global audience. The award was bestowed upon Her Excellency in a special ceremony hosted yesterday at the Institute’s 72nd Annual Awards Banquet and Conference at Washington Marriott Wardman Park Hotel Washington, D.C. The Middle East Institute Visionary Award recognises an Arab individual or institution for outstanding work in the region. Awarded for her dedication to the art and culture industry in the Middle East, inspiring artists to create, generations to innovate, and communities to unite and prosper, Huda I. Al-Khamis Kanoo was presented the award by Alicia Adams, Vice President of International Programming at The John F. Kennedy Center for the Performing Arts. Also in attendance was Dr. Paul Salem, President of the Middle East Institute, along with hundreds of top officials, analysts, and business leaders representing a diverse cross-section of the Middle East-focused community.